Description: This highset solid three-bedroom home has recently been re-vamped so it's ready to move into immediately. Freshly painted throughout, new flooring, new bathroom-there's little to do except move right in. 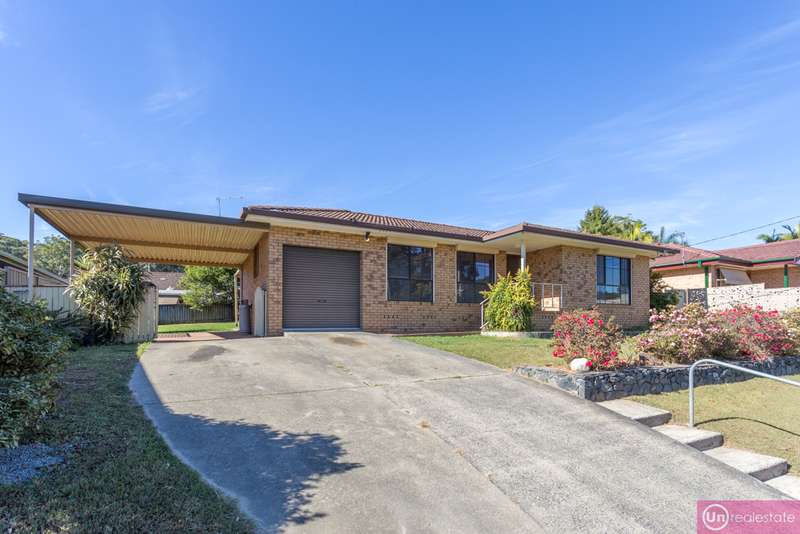 Located mid-way between Toormina Gardens Shopping Centre and Boambee East IGA, and an easy walking distance to local schools, this great family friendly home is in the perfect position. Sited on a 699.4sqm block, the property has side access and a high, double covered carport is already in place-perfect for those with additional vehicles, the garage itself has garage doors either end (the front is automatic) so you can drive through as well. The front yard has been tiered to make mowing easier and to create a more useable yard, but the low retaining walls are made of rock, so there's no future concerns about replacement. The layout is practical-with an L-shaped lounge and dining area, complete with brand new timber look vinyl planks and blockout shutters, kitchen in the middle, and another living space at the rear opening up to the covered entertaining area and yard. The kitchen itself is well-thought out-with plenty of cupboard space, bench space, wall oven, dishwasher, and breakfast bar. All three bedrooms are a double-size with plenty of robe space, with the main (complete with blockout shutters) opening into the beautifully renovated bathroom. With a deep bath and large shower in one room, generous vanity and separate toilet, there's no need for the family morning traffic jam-everyone has their space. The extra toilet in the laundry is also exceedingly handy.